It seems that on the weeks that don't buy bananas my family gets irritated and asks "Why didn't you buy any bananas this week?" On the weeks that I do, they sit there untouched. I love this recipe for those weeks when my family just lets them get very ripe. 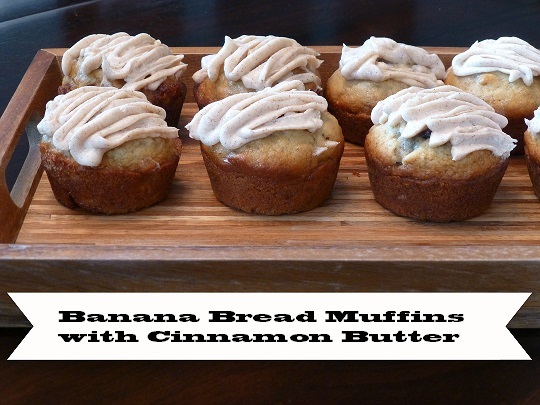 These are truly one of the best banana muffins I have ever had. The first time I made them my husband asked if I would make them again tomorrow. Preheat oven to 350 degrees. Spray muffin cups with cooking spray and place in muffin tin (or just grease muffin tin if you don't use muffin cups). Mix sugar, oil, and egg until creamy and light yellow. Add bananas and walnuts. Next add flour, baking soda, and salt. Stir until completely smooth. Fill muffin cups 3/4 full. Bake for 30-40 minutes, or until a toothpick comes out clean after being poked through the center of a muffin. Mix butter with 1/2 cup of the confectioners sugar, adding up to 1/4 cup more until you reach your desired consistency. Mix in cinnamon. Serve with muffins. Ohhhhh these look soooo good! I am definitely bookmarking this recipe!! My family is the SAME way! If I don't buy bananas, that's all they want...but if I do, they usually sit there getting black lol. Great recipe post!! yuuuuummmmy! I love banana muffins :) best with choc chips heehee. Never tried cinnamon butter before though ;p thanks for sharing the recipe! Thanks for the idea of adding chocolate chips. I have a bag of mini chips in my cabinet right now that I will have to try in these! These look very yummy! I definitely want to try them! I have three ripe bananas waiting to be baked right now. I think I'll try and make these this afternoon. Thanks for the recipe!